The solution has been distilled down to four basic steps. Click image to enlarge & please send me your comments/questions and ways to make explanation better! Each step is explained in greater detail below! 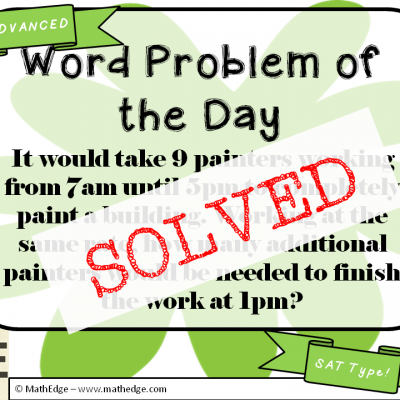 This word problem is all about combining rates. Understanding how to setup this problem correctly is extremely important. 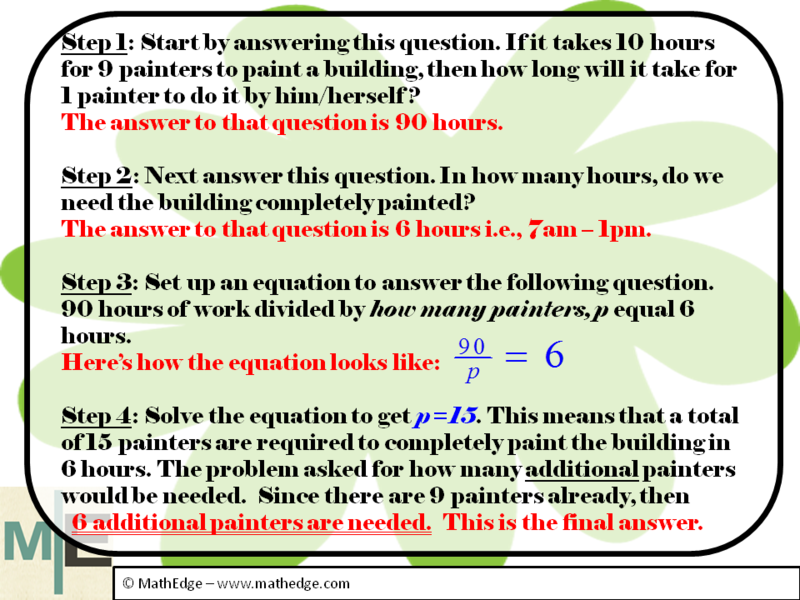 Important note, although I have broken this solution out into four steps, I think once your students fully understand the concepts - the solution can be distilled down to two steps. At any rate, let's review each step in detail. When trying to combine rates, it is often helpful to determine the rate at which a single member of the group operates. A single painter can paint the entire painter in 90 hours. How? First from 7am to 5pm is 10 hours. All 9 painters are painting at the same rate. Therefore, at the end of the 10 hours each painter would have painted 1/9th of the building. If there's only 1 painter then 8/9th of the building would be remaining and each 9th of the building will require 10 hours each. Therefore, 10 x 9 = 90. I find that it is very helpful to break down this step further by giving students a simple example. Say this: "If you and your brother working together can clean your room in 30 minutes, then how long will it take you to do it by yourself? (Assuming you both are cleaning at the same rate)". They should be able to "visualize" that the answer is 60 minutes or 1 hour. Another way to visualize this step is to ask the student to imagine that the building that needed to be painted had 9 floors. Each painter occupies one floor and each painter takes 10 hours to paint each floor. Now since there are 9 painters and 9 floors with 1 painter on each floor, then the entire building is completely painted in 10 hours. But now if there's only one painter working alone, then the entire building will be completely painted in 90 hours. 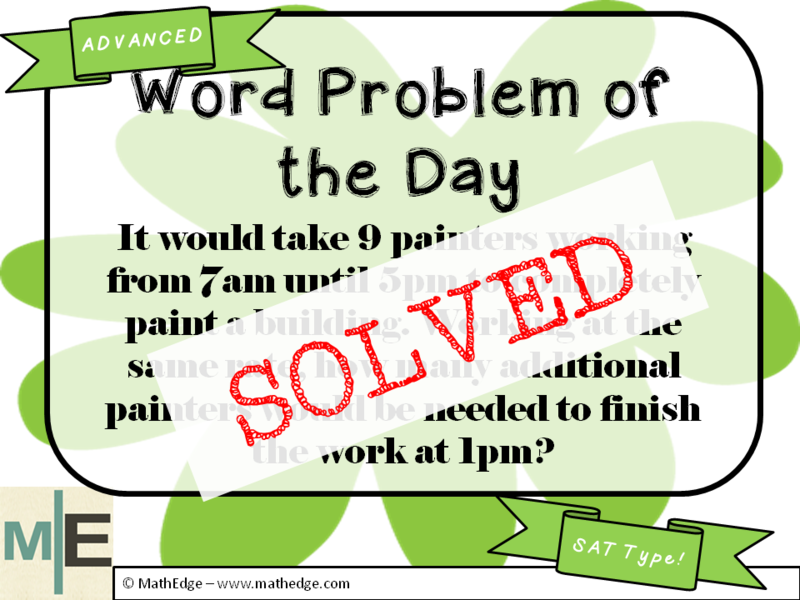 The next part of the solution involves finding how many hours the work need to be completed. 7am to 1pm is 6 hours. Therefore, the building need to be completely painted in 6 hours. This is the most important step. We have 90 hours of work that need to be completed in 6 hours. Before digging into how to set this up, consider this: Assuming the work had to be completed in 90 hours, then only the 1 painter will be required -- in other words 90/1 = 90. If the work needed to be completed in 45 hours, then we will needed 2 painters -- in other words 90/2 = 45. Again, simplify the concept with the bedroom example. If the bedroom needed to be cleaned in 30 minutes then 2 siblings are needed at the same time to work on the room. If the bedroom needed to be cleaned in 15 minutes then 4 siblings are needed to work on it together. In this case, the building need to be completely painted in 6 hours. Therefore the question that needs to be answered is this: 90 divided by what gives 6? Solving the answer to the question yields 15. And this number represents the number of painters that are needed. And if 9 of the painters are already available, then 6 additional painters are needed to meet the targeted time.